Vicuña is the common name for a rare, wild, gregarious South American camelid, Vicugna vicugna, found in high elevations of the central Andes mountains and characterized by a long neck and legs, slender body, incisors that are always growing and with enamel only on one side, and a lower lip with a central crevice. The vicuña is the smallest member of the camel family (Camelidae), a group that in South America also includes the domesticated llama and alpaca, and the wild guanaco. 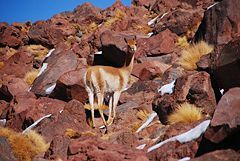 Vicuñas are renowned for their long, very fine, and yet strong wool, which makes a prized, expensive, lustrous, and exceptionally soft and warm cloth. The yield from individual animals is small, with about 40 animals needed to produce cloth for a coat, and the animals being shorn only about every two to four years. Unlike the similar but domesticated llamas, obtaining wool from the wild and rare vicuñas requires first their capture, then shearing, and then release back into the wild. Both under the rule of the Inca and today, vicuñas have been protected by law. The Inca raised vicuñas for their wool, and it was against the law for any but royalty to wear vicuña garments. Today, the CITES Convention requires only cloth from live animals being traded. Before being declared endangered in 1974, only about 6,000 animals were left. Today, the vicuña have recovered to about 125,000 but organizations such as the IUCN and the U.S. Department of the Interior still consider it endangered. Ecologically, the vicuña is part of a food chain that includes as its main predators the puma and foxes, and the Andean condor will attack weak and ill animals and baby vicuña. Vicuñas are even-toed ungulates (order Artiodactyla), with two-toes on each foot and an "unguligrade" form of locomotion. (Unguligrade involves most of the weight of the animal supported by the hoofs, in contrast with "digitigrade," where the toes touch the ground, or "plantigrade," where the entire foot is on the ground, as in humans.) There are three other camelids in South America, the domesticated alpaca (Lama pacos) and llama (Lama glama), and the wild guanaco (Lama guanicoe). The alpaca is sometimes placed in the Vicugna genus (Vicugna pacos). The vicuña, relative to the guanaco, is smaller, more slender in its proportions, and with a slightly shorter head, and the ears are slightly longer. The length of head and body ranges from 1.45 to 1.60 meters (4.75-5.25 feet), with a shoulder height from 75 to 85 centimeters (29.5-33.5 feet). The weight of the vicuña is from 35 to 65 kilograms (73-143 pounds). The vicuña also is considered more delicate and graceful than the guanaco. The most apparent visual difference between the vicuña and the camel is that camels have a hump or humps and vicuñas do not. Although the vicuña and guanaco coats may look thin, they are made up of insulating hairs that are exceptionally soft and warm. The long, woolly coat of the vicuña is tawny brown on the sides, back, and neck, while the hair on the throat and chest is an off-white and quite long. This long check hair helps to insulate the animal when resting on the ground (Grzimek et al. 2004). The inner thigh surfaces and ventral surfaces are white. The lower incisors are unique among the even-toed ungulates (Artiodactyla) in that they have enamel only on one side and are always growing (Grzimek et al. 2004). The front premolars are simple and usually separated from the other cheek teeth; sometimes the canines are absent in the lower jaw (Grzimek et al. 2004). The vicuña, like all of the South American camelids, digest their food by the process of rumination. Their stomachs are divided into three chambers (Nowak 1983). After food is swallowed, it is kept in the first chamber for a while where it is partly digested with the help of bacteria and protists. Vicuñas live exclusively in South America, primarily in the central Andes. They are most commonly found in Bolivia, Peru, Chile, and northwest Argentina. Peru has the largest number. Bolivia has a great number of wild vicuñas in the southwestern side of the country. Vicuñas live in the grasslands and plains in the mountain regions at an altitude of 3,500 to 5,750 meters (11,480 to 18,860 feet) (Grzimek et al. 2004). There are many places they live but one usual place where they can be found is in the grassy plains of the Andes Mountains. In these areas, only nutrient-poor, tough bunch grasses, and Festuca grow. The sun's rays are able to penetrate the thin atmosphere producing relatively warm temperatures during the day; however, the temperatures drop down to freezing at night. The vicuña's thick but soft coat is a special adaptation that traps layers of warm air close to its body so it can tolerate the freezing temperatures there. The behavior of the vicuña is similar to that of the guanaco. Vicuñas are very shy animals and are easily aroused by intruders, due among other things to their extraordinary hearing. Like the guanaco, it will frequently lick calcareous stones and rocks, which are rich in salt, and it will also drink salt water. Its diet consists mainly of low grasses that grow in clumps on the ground. Vicuñas live in family-based groups made up of a male, and 5 to 15 females and their young. Each group has its own territory of about 18 km², which can fluctuate depending on the availability of food. Mating usually occurs in March-April, and after a gestation period of about 11 months the female gives birth to a single cria, which is nursed for about 10 months. The cria becomes independent at about 12 to 18 months. Young males will form bachelor groups and the young females search for a sorority to join. Along with preventing intraspecific competition, this also prevents inbreeding, which can cause a population bottleneck in endangered species as observed with cheetahs. The vicuña fiber is popular due to its warmth, fineness, and beauty. Its warming properties come from the tiny scales that are on the hollow air filled fibers. It causes them to interlock and trap insulating air. At the same time, it is finer than any other wool in the world but since it is sensitive to chemical treatment, the wool is usually left in its natural color. However, the vicuña will only produce about one pound of wool a year. Gathering it required a certain process during the time of the Incas. Vicuña fibers were annually gathered through communal efforts called chacu. Here, hundreds of thousands of people would herd hundreds of thousands of vicuña into previously laid funnel traps. The animals would be sheared and then released and was only done every four years. The vicuña was believed to be the reincarnation of a beautiful young maiden who received a coat of pure gold once she consented to the advances of an old, ugly king. Because of this, it was against the law for anyone to kill a vicuña or wear its fleece, except for Inca royalty. From the period of Spanish Conquest to 1974, there was unrestricted hunting of the vicuña and reducing its numbers to only 6,000 in the 1960s. As a result, the species was declared endangered in 1974 and its status prohibited the trade of vicuña fiber. In Andean Bolivia, the Ulla Ulla National Reserve was founded in 1977 partly as a sanctuary for the species. Their numbers grew to 125,000 in Peru, Chile, Argentina, and Bolivia. Since this was a ready “cash crop” for community members, the countries relaxed regulations on vicuña fiber in 1993, enabling its trade once again. Although the recovery is somewhat comforting, these animals are still classified as vulnerable by the IUCN and endangered by the U.S. Department of the Interior. In some areas, in order to prevent poaching, commonly there is a round up every year, and all vicuñas with fur longer than 2-1/2 centimeters are shorn. At present, the Peruvian government has a labeling system that identifies all garments that have been created through a government sanctioned chacu. This guarantees that the animal was captured, sheared alive, returned to the wild, and cannot be sheared again for another two years. The program also ensures that a large portion of the profits return to the villagers. However, annually up to 50,000 pounds of vicuña wool are exported as a result of illegal activities. Because of this, some countries have banned the importation of the fiber in order to save the animal. And although it is possible to commercially produce wool from domesticated vicuñas, it is difficult because they tend to escape. The 2008 prices for vicuña yarns and fabrics can range from $1,800 to $3,000 per yard. Vicuña fiber can be used for apparel (such as socks, sweaters, accessories, shawls, coats, and suits) and home fashion (such as blankets and throws). A scarf costs around $1500 while a man's coat can cost up to $20,000. In December 2006, the General Assembly of the United Nations proclaimed 2009 to be the International Year of Natural Fibers, so as to raise the profile of vicuña and other natural fibers. Alpaca Fiber News. n.d. 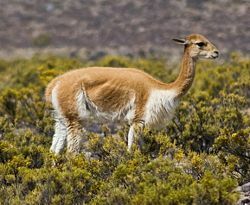 The vicuna: The precious treasure of the Andes. Alpaca Fiber News. Retrieved November 21, 2008. Bayly, A., and E. Pasquel. 2006. Privaticemos las vicuñas. Revista de Economia Derecho 2006 (Summer): 69-80. Retrieved November 21, 2008. Lichtenstein, G., L. Villalba, D. Hoces, R. Baigún, and J. Laker. 2008. Vicugna vicugna. In IUCN, IUCN Red List of Threatened Species. Retrieved November 21, 2008. Nowak, R. M., and J. L. Paradiso. 1983. Walker's Mammals of the World. Baltimore: Johns Hopkins University Press. ISBN 0801825253. Peruvian Connection. n.d. Vicuña fiber: The golden fleece. Peruvian Connection. Retrieved November 21, 2008. This page was last modified on 21 November 2008, at 20:00.